Sometimes, you just get lucky! Very lucky, for us, on this occasion. A proper wow moment as we stepped out onto the balcony of our little apartment at Fora Apart Hotel in Datça. We’d just had three great nights in springtime Bodrum and made the leisurely ferry journey to our next destination. If you remember from that little tale, Barry had used some of that time on the ferry to find us somewhere to stay whilst we were exploring Datça town. Cheap, central, decent reviews. That’s all we wanted and Fora Apart Hotel looked like it would fit the bill. And even I, directionally challenged as I am, was able to spot Fora Apart Hotel almost as soon as we got off the bus. Ahhh, unlike places like mazey Kaleiçi in Antalya, the geography of Datça was to prove very friendly. 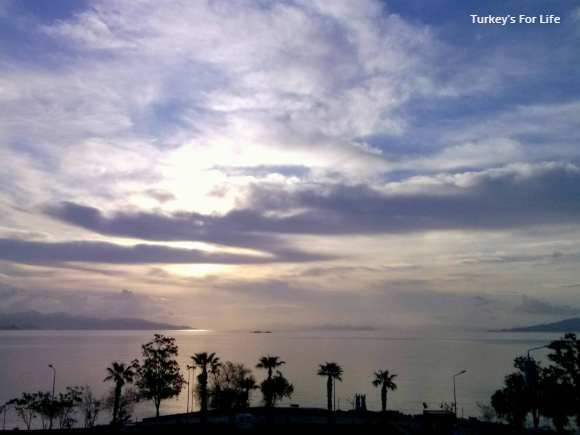 One of the advantages of travel in Turkey before the season is in full swing is that, more often than not, you don’t need to worry about booking accommodation too far in advance. We decided to just take our chances with Fora Apart Hotel and if they were full, we could always wander on somewhere else. We walked up to reception and the guy confirmed they had rooms available. Up-selling is wasted on these two budget travellers but we let him go through the room choices. This has a sea view, this is a suite, this has three rooms. Fine by us. We just want a clean bed and a shower. And off we trundled up the stairs with our room key. There’s no lift at Fora Hotel so bear that in mind if you’re booking a room here. A sign on one of the landings gave us a little giggle as we climbed the stairs. “Lütfen odalarda balık pişirmeyiniz.” Please don’t cook fish in the rooms. Clearly, previous guests have really made themselves at home when they’ve stayed here. Fora Apart Hotel must have had issues in the past with people frying and grilling all the lovely fresh fish you can buy in Datça. Great for the families but perhaps not so great for the hotel’s aromas wafting around the stairway. Anyway, we finally arrived at our room and slipped the card into the door. For the money we’d just paid, we were expecting a simple double room with bed and shower room. So we were already feeling lucky when we realised we had a separate double bedroom, shower room and then a separate lounge-diner complete with kitchen. So much room to spread out and get comfortable. Happy days! As I inspected cupboard contents, Barry opened the balcony doors and let out a big “Woooow.” Wow, indeed as I rushed over to see what the fuss was about. Whenever we book cheap rooms, a window is a bonus. When there is a window, there’s usually some sort of screen to hide whatever’s there. Pipes, shafts and the like. So to walk out onto our balcony at Fora Apart Hotel and be greeted with panoramic views across the whole bay; just stunning. 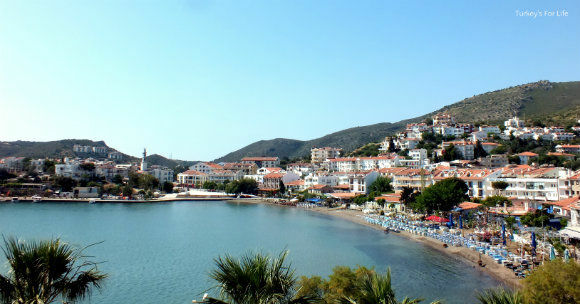 And Datça’s a working town. Directly below us was a children’s play park and to our right, the local primary school. A class was in the playground practising some end of term performance; some kids clearly keener than others when carrying out their coordinated moves as they repeated their sequence for the umpteenth time. If you remember from our last post, we said we decided to stay around for another night and you can probably understand why. After fuelling ourselves with the simple buffet breakfast – and eating too much simit – we checked at reception to see if we could stay another night. Yes, we could! For that second night, we got drinks and snacks from the nearby supermarket and put them all in the fridge for later. An early dinner at one of the beachside restaurants and then we just went back to the apartment to sit on the balcony and enjoy the Datça scenery. And why not? A memorable stay in Datça, not only because we loved the town so much but because our room – and those views – at Fora Apart Hotel was such an added bonus. In April 2019, we decided to take part in the annual RunDatça event and there was no question of where we were going to stay. 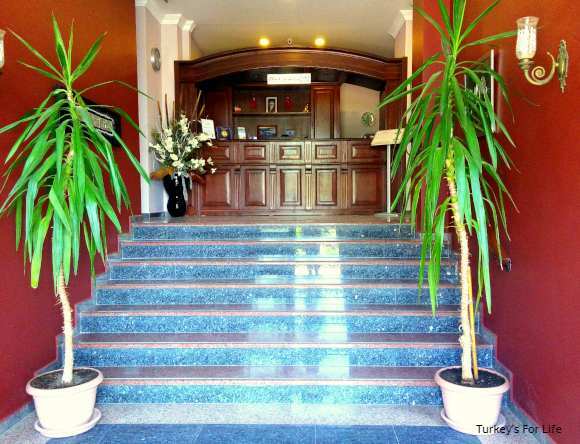 We booked an apartment at Fora Apart Hotel, and, again asked for one of the cheaper top floor apartments. Space, bed, lounge-kitchen, shower room, balconies, views. That’ll be fine for us. A couple of friends joined us and they booked one of the apartments below us. Great. That meant we got to have a little mooch around their place to see how they differed. If you’re looking for smarter furniture with a slightly more upmarket feel – and fewer stairs to climb – then these are the apartments for you. But back to our pad at Fora Apart Hotel. This time, we were in the end apartment. We still had the balcony with the wow views across the bay but we also had a side window. It’s the little window you can see in the gable end of the building in the top photo. An early wake up one morning, a stumble to the fridge for refreshment and a peep through that window. Ahhh, a stunning sunrise! Granted, just out of shot, we’re looking out over a car park. But who cares when this scene stretches out beyond that? 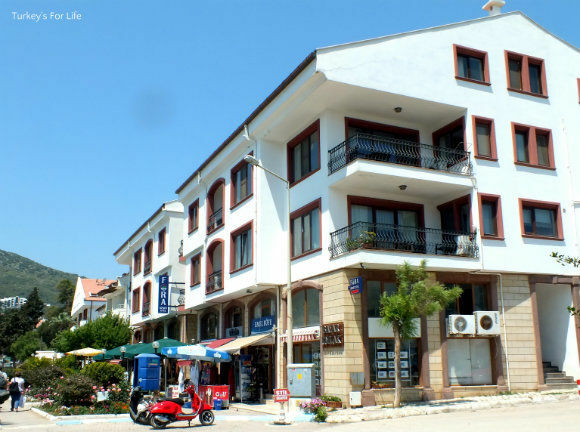 As with our stay last year, we got a bit settled at Fora – and in Datça. On our last morning, we went down to reception and asked if we could have the apartment again for one more night. And we could. So we stayed. 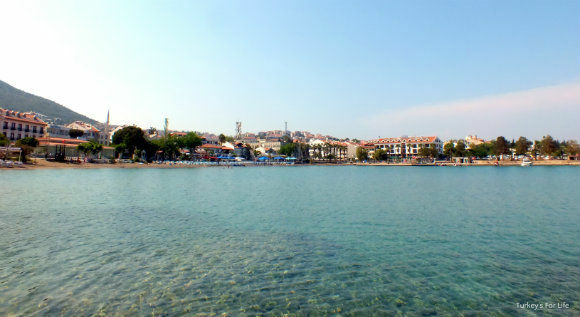 Fora Apart Hotel is on the seafront of Datça town, overlooking Kumluk Yolu and the bay. Apartments are differently-priced depending on size and whether you want a sea view or not. Our apartment had double bedroom and lounge diner. Both rooms had air conditioning. We stayed at Fora Apart Hotel early season and so paid a cheaper tariff. Prices increase for the high season. Fora Apart Hotel is around 10mins walk from the otogar. 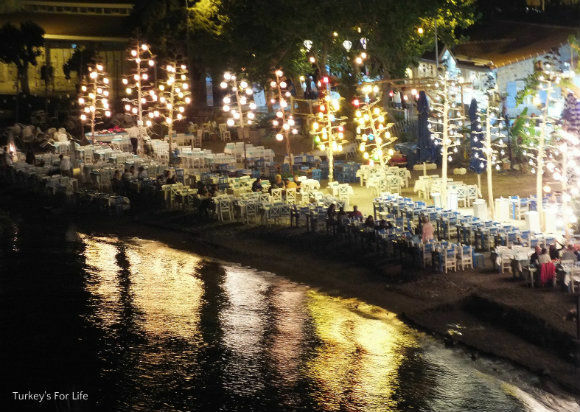 From here, you can get a dolmuş to places like Palamutbükü and the Knidos ancient ruins.